Collect a diverse range of shots of your chosen subject – long shots and close shots, low angle and high, moving shots and still shots. What you are searching for is anything that stands out a special to you – something with narrative potential or conceptual resonance or just an interesting shot or image. My chosen subject was a journey on the DART. A journey I had not made before. Although many of the suburbs were familiar to me. 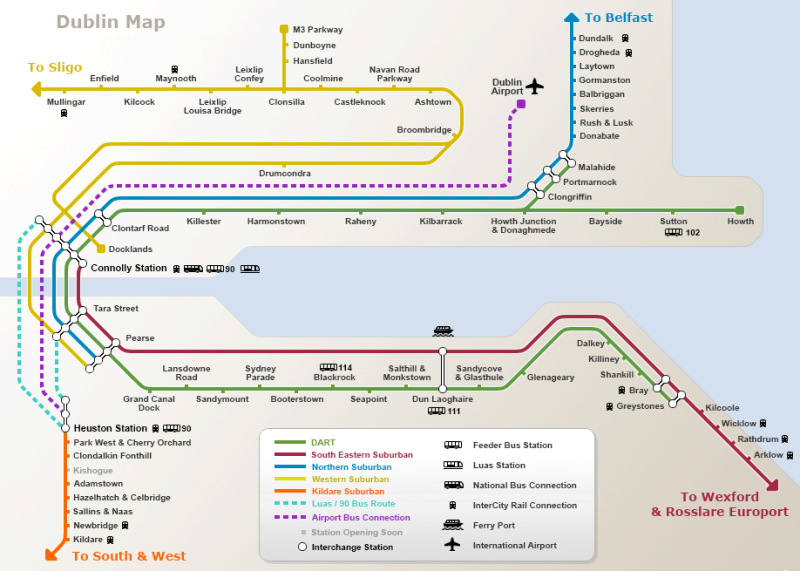 The DART (Dublin Area Rapid Transit) system serves the coastline and Dublin city centre, stretching from Greystones in County Wicklow to Howth and Malahide in north County Dublin. For the purposes of this project I decided to travel the full length of the southern stretch of the line between Pearse Street station in the city centre and Greystones in County Wicklow, as that would be manageable in a single day. The project guidelines suggested I should ‘think of this as active visual research’ rather than making a finished film of a particular type. As the country was in the midst of a heatwave, I decided to travel light and carry as little equipment as possible. So rather than take my usual full size camera with me, I decided to use the smaller Sony A6500 camera. This enabled me to move around quickly and unhindered by equipment. It also meant I could be more discreet in my approach when filming. I used the camera without any additional add-ons or a tripod. I also decided to use the kit lens (Sony Zeiss 16mm-70mm f4) rather than carrying a bag of Samyang cine prime lenses. Using a telephoto lens rather than four individual lenses meant I could work quicker. The telephoto range of the kit lens is quite good, covering a wide range of focal lengths from wide angle to shorter telephoto. I also attached a 0.9 ND filter to the front of the lens to enable me to shoot with a shallow depth of field. Though on the day, the sunlight was such that I rarely managed to get down to f4. I spent the whole day capturing shots, starting in the area around Pearse Street station and then boarding the train and travelling south along the coast. I got off the train at several stations to capture shots from the platforms and left the station at two places to explore the surrounding areas. The weather on the day was extremely hot and sunny. The light was so bright that it was difficult to see the LCD screen on the back of the camera, which made it almost impossible to find focus for the shots. Which meant working with the viewfinder only. As I had chosen not to take a tripod, I was able to operate the camera handheld, which allowed me to move quickly and spontaneously both within and off the train. Which meant I could capture shots as and when I saw them. One of the joys of this project was that I didn’t know what to expect. Thinking of this as an exercise in visual research was very liberating. I worked spontaneously, capturing things as and when I saw them. I captured more than 150 shots in the day. Almost an hour of footage. However, some of the footage was not usable. This was partly due to inaccurate exposure or poor focusing, and to duplication – shots were too similar. Some shots didn’t feel right within the context of the film. Other shots were simply too dull, uninteresting or too static. I began editing by looking for visual, conceptual and continuity connections. I looked for a sequence of shots that would work together for the opening of the film. I selected several city shots: a long shot over the river Liffey with traffic crossing a bridge; a wide shot of a parked lorry with the the FM104 radio lorry passing in front; a series of shots of the DART train crossing bridges. My aim in selecting these shots was to set a slow, meditative tone and introduce the theme of the journey. I then decided to cut to a dark, moody, eerily empty shot of the stairway inside Pearse Street station. I liked the emptiness it portrayed. This was something I was not expecting at the time on a weekday morning. From there the film follows roughly the actual route of the journey. I realised there were two visual threads within the film: one inside the train; the second in the external locations along the route. So I built up the film by cross-cutting between these two threads. What struck me about many of the shots I had captured was how empty they were of people. I decided to go with this and build sequences of quiet, empty spaces. Even the sea was quiet. There was a calmness and tranquility about the day and this comes across in many of the shots I captured. So I decided to go for a more meditative film. One of the first things I did was ditch all the camera sound and look for a piece of music that would give the film a meditative feel. As I was filming, I had thought I would be using the camera sound to help tell the story. The sound of the train approaching the platform, the sound inside the carriage, the general background noises of the the various places on the journey. But I decided to ditch the lot. Going instead for the pictures only, I found I was looking at shape, pattern, line, colour and, more interestingly, the contrast between stillness and movement within and between the shots. I also noticed several motifs emerging: ‘keep behind the line’; platforms; water. Some shots cut together to give a sense of where we are and what is happening. Such as on the platform in Pearse Street station. In other places I cut images together in order to create contrast. For example: at 1:10, the exterior shot of the DART contains a strong sense of movement and activity is juxtaposed with the interior shot of the empty stairs; at 2:53, the static shot of the glass building behind the platform is juxtaposed with the moving shot inside the train looking out through the window; at 4:37, the interior of the train is contrasts with the unusual design of the interior of the footbridge with a view over the sea. I purposefully held some shots longer than expected. I did this to give the viewer a sense of how slowly time seems to pass on a rail journey and to help reinforce the meditative feel of the film. Four shots in particular were held longer than expected: 00:20 to 00:41 – the shot of the DART crossing the river is allowed to run long enough for the viewer to see all the carriages cross the bridge; 01:35 to 02:11 – the shot of the woman on the platform waiting for the train to arrive; 04:46 to 05:23 – the shot of people descending the station steps (also reduced in speed by 50%); 07:44 to 07:59 – the shot inside the carriage as it emerges from the tunnel. The choice of background music was quite straightforward. I wanted something that felt meditative and found a piece of ambient music on premiumbeat.com that also had the sound of waves in the background. I thought this would be an unusual, but effective piece to use, as it enabled me to foreshadow the sea. The sound of waves at the start of the film does not match with the pictures on screen. It is only when we see the sea that it makes sense. Choosing the final shot was the most difficult part of the editing process. Nothing really stood out to me. There wasn’t anything that made a bold, dramatic statement for the film to end on. I tested out a few different shots, but they didn’t flow very well with the rest of the film. I then realised that I didn’t need a dramatic shot to finish with. Instead, as this was more of a meditation than a documentary, I decided to go for a wide shot of the beach and sea.